On a typical day at the Scarborough Cycles bike hubs, brakes get tightened, tires get pumped, chains get oiled and hands get a little bit dirty. 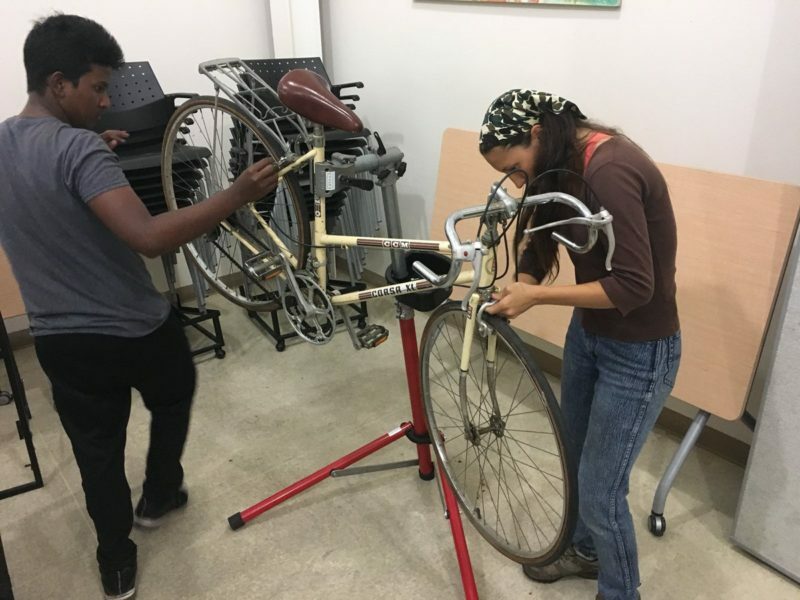 Youth learn bike repair skills while volunteering their way to bike ownership through the Earn Your Bike program, and newcomers are mentored on safe places to ride in the city. The day often ends with a community bike ride exploring local neighbourhood streets. At first glance, these activities may not appear to be closely linked to both community and residential health, however health is a key motivator and a strategic priority for Access Alliance Multicultural Health and Community Services, one of our bike hub host agencies (the other is Birchmount Bluffs Neighbourhood Centre). Recent research has revealed significant health benefits of regular physical activity, and cycling in particular. A UK study of over 250,000 adults found that people who cycle to work have a 41% lower risk of death from any cause, including cardiovascular disease and cancer. The health benefits were higher than for people who walk to work because the activity is more prolonged. They were also higher than for people who go to the gym, because the exercise is built into daily life and requires less self-motivation. In the U.S., studies have found that those who have an active commute are half as likely to be obese, whereas every additional hour spent in a car is associated with a 6% increase in obesity. Furthermore, a Canadian study calculated that physical inactivity alone is directly associated with $1.6 billion in annual health care costs. We know already that health challenges are not evenly distributed across the city. For example, neighbourhoods in Toronto’s outer wards tend to have higher rates of diabetes. Not coincidentally, these neighbourhoods also have less cycling infrastructure. Of the 11 city wards without on-street bike lanes, five are located in Scarborough. Moreover, in all of Scarborough, there is only one bike shop where people can have their bikes serviced. Scarborough Cycles’ two bike hubs are a step towards addressing these gaps. By providing low-cost access to bike repair services, workshops, and other on/off-bike programming we are removing barriers and enabling residents to ride their bikes for everyday local trips. By showing residents safe routes around the city, we are introducing a new form of transportation to them that is healthy, economical and reliable, and ultimately helps facilitate fair opportunities to access important community support services. As we work to build bike culture beyond the downtown, we are also growing community health and well-being in quite frankly, a fun and practical way. In celebration of Community Health and Wellness Week, Scarborough Cycles will be hosting a community bike ride to scenic Rosetta McClain Gardens on Saturday, Oct 21, 2017. Departure is at 11:15 am from 3079 Danforth Ave, at the AccessPoint on Danforth Bike Hub. Yvonne Verlinden is the Scarborough Cycles Project Coordinator at the Toronto Centre for Active Transportation.